Moreover the phrase “4 season tent” is a misnomer since it refers to winter tents, which you might not use the rest of the year because they could be too heavy or too hot. This raises the question: when I'm hiking in the mountains, I might one day be camping in the valley with 10+°C (50 deg F)night time temperatures, and the next night at the mouth of a glacier with a high -5°C (23 deg F) (wind coming down). Are any tents suitable under both conditions at all? Of course. You can (almost) always cool down a 4-season tent, but you can't very well protect a 2-season tent from a blizzard. The primary concern is weight, but if you're going to be camping near a glacier with -5°C winds, you'll want a sturdy tent, so that's going to come at a certain cost of weight. To keep a tent cooler, you can pitch it in the shade, you can open the vents and windows, etc. There's nothing wrong with using a 4 season tent in the summer; I've done this on many a trip. The point of the quote you referenced is that a 4 season tent may not be ideal in non-winter conditions, as there may be a more convenient tent, but the a 4 season tent is certainly more than adequate for camping in summer conditions. Well... a 4 season tent is a 4 season tent... You can use it during the whole year without any problems while a 2 season tent might not be as pleasant during the winter. I receive questions like this all the time. "What sort of boot should I get? ", Packs, tents... My answer is kind of consistent for most of them... You buy gear for what you are going to use it for. I have a variety of tents to use from 2 season, 4 season and flys. I do lots of mountaineering so I carry my 4 season tent a lot. My 2 season one was a cheap/light one for camping/hiking during autumn/Spring and because I live in a place where there are no things to eat or kill me during the night, I carry my fly during summer. Of course, you can chuck a lot of money in outdoor gear, it's for sure a black hole. That said, you can get around with a 4 season and be fine while a 2 season would restrict you a bit more. As said by nhinkle, there are other considerations to keep in mind. A 4 season tent is much heavier than a 2 season one, and if you are going to camp on top of a mountain or close to a glacier, you will need more gear for that which will stack up pretty quickly. I've had trips where, due to the amount of gear, I took my two season tent to the mountain, top up with warm layers and we camped a few hundred meters below the exposed tops. The next day, we left the campsite, climbed the mountain and went back to the campsite. We had the weather in mind and it was perfect conditions but it could be done under some average weather as well. Many 4-season tents cannot be ventilated as well as tents made for summer conditions. Also, they tend to be larger. this means, you can use them, but it won´t be ideal. This differs a lot with the actual models you are comparing, some might be well suited for all conditions. Note that the temperature difference between summer and winter trips normally has to be taken care of with the sleeping bag you choose - tent insulation is (normally) not that much better in 4-season-tents. The main difference is sturdiness, as its needed with wind and snow loads. For the scenario you described, where storm and snow are not really important concerns, you could just bring the 2-seasons tent and a good sleeping bag inlay, which allows you to adjust to the different temperatures. Late to the show, but I'm not entirely convinced by the current answers. The term "4-season" can mean anything from a tent that can cope with a bit of snow like the Hilleberg Red Label series, to full-on expedition tents like the Hilleberg Black Labels. And when SectionHiker is talking about "too heavy or too hot", his context is long-distance walking in New England conditions. If you're doing a different activity in a different place, your definitions will change. When I was a climber, I didn't mind carrying a bomber, comfy tent for a few hours to set up a basecamp - a couple of kilos was "light". Now that my focus is long-distance mountain walking my definition of "too heavy" has changed radically - nowadays I would shoot for a quarter of that, even in the UK winter. And "too hot" means very different things to someone who walks in Sweden vs someone who walks in Arizona. So if "a true 4-season tent" means a tent that would work for everything between the Mojave in June to a winter ascent of Denali, the answer is obviously no. But if you're talking about a shelter for a walk that might involve a steamy valley and an inch or two of snow by a chilly glacier, the answer is very much yes. But you have a number of workable options, and the right choice for you will depend on a wide range of factors. For someone with experience, a 9oz/250g flat tarp or a 12oz/350g pyramid tarp could match any 5lb/2.5kg Hilleberg Red Label for performance and safety in moderate winter conditions. And they would easily adapt to provide excellent summer shelter as well. The right choice of sleeping system and optional additional bivy protection etc. And it also requires a different attitude to comfort and exposure to nature. So there are no free rides. With modern materials you can push lightweight shelters into some pretty hairy conditions, but only if you know what you are doing and are prepared to compromise on comfort. Or you can enjoy the comfort and safety of a Red Label Hilleberg, but at the cost of lugging 3-4 times the weight. And there is a spectrum of solutions in-between. So as always with questions of gear selection, the real answer is that it depends. It depends on your activity, the range of conditions you'll encounter, your skills and experience, and your personal preferences, dislikes and tolerance of risk. I wish I could offer you some kind of easy answer, but that would be dishonest. Even seasoned walkers struggle with their choice of shelter, and with how their shelter integrates with their other equipment selections. Most keen mountain walkers are continuously refining their systems as their experience develops. If you ask a more specific question we could offer more specific advice. But more generally I would urge you to join the online communities that gather around your field of interest and begin the long process of building your knowledge and experience. We've always had a three-season tent and have comfortably camped in and outside the range the OP specified (50 F to 23 F or 10 C to -5 C). The only time we were really uncomfortable was at 4 F (- 15 C), and that was partly because we were camped on snow, which melted and then froze so it was like sleeping on a lumpy, narrow, hard mattress. As others said, it is easy to cool down a tent that is too warm (except in blazing sun). If the tent is not warm enough, you put on more clothes. In the 4 degree F case, I was cold even wearing my parka inside my sleeping bag. I think an extra insulating pad would have helped a lot. So, if your range is as stated in the Q, a sturdy three season tent is OK. If the tent fly can be pitched without the inner then your winter tent becomes a summer tent by leaving the inner at home. If you pitch a tarp right it is the best 4 season shelter for 4 people. A square tarp with 4 corner pegs and 4 42" (11 dm) corner poles and a chimney center pole is the best 4 season shelter. Tight to the ground all the way around on cold windy days all 4 sides open on hot days, All cooking done inside on a solid fuel cook stove weighing no more than 1.5 lbs (0.7 kg). Each man sleeps in a bug proof bivy. I own both a 3 season tent and 4 season. I car camp in warm weather all the time with my 4 season tent because it is bigger. Once you unzip the door you get a lot of ventilation. Not the answer you're looking for? 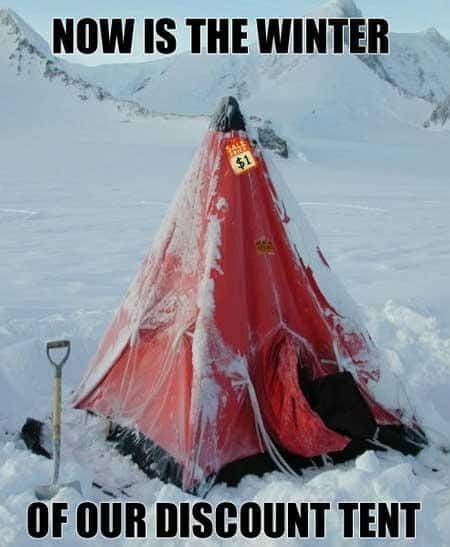 Browse other questions tagged tents temperature winter-camping or ask your own question. Are there 1-person 4-season tents? Benefits of tree tents over typical shelters?